I first want to acknowledge that I know it’s been quite some time since my last submission, and for that I apologize - it’s been a crazy last couple months. However, my absence provides me with loads of new material to share. While it may not be the most interesting subject matter in regards of how I think or what goes thru my mind, I initially started this blog in hopes of providing y’all, with an insight of what the day to day for a professional footballer is like - so here we go. For those unaware, we lost to the New York Red Bull’s II last November after a historic, record setting 2018 season. Once the final whistle blew during that match, the 2018 season was officially over and my offseason had begun. You can ask any professional from any sport about the offseason and they will more likely than not all say the same thing - its dreadfully boring while also extremely stressful as their contracts may have ended and their next opportunity is unknown. For me, things were a bit different this time around. I was fortunate enough to begin my negotiations and sign my MLS contract with FCC before the conclusion of our season; meaning that I would be able to enjoy my offseason while also focusing on what was just around the corner. I stayed in Cincinnati for 2-3 weeks after our season ended for a few reasons. For one, I needed to give my body and mind time to heal, relax and recuperate. I also wanted to spend time with my teammates that would soon be my ex-teammates as not everyone would be making the transition with the club into 2019. We had a very special 2018 campaign with an extremely special group and before we all went our different directions, I wanted to spend time “decompressing” with the guys that were no longer teammates, but friends of mine for a lifetime. After spending a few weeks in Cincinnati with zero soccer responsibilities, I would then head back to Raleigh, NC to spend thanksgiving week with my family. After about 8 days at home, I would pack my bags again and head down to Charleston, SC for 2 weeks to start my offseason program. I have to admit, I was also going down to Charleston to enjoy some warmer weather, beach time, and time with close friends. My offseason program started with 10 days of training with a good friend of mine, Kenny Cooper, a retired professional whose career started with Manchester United and ended with playing for a few teams in MLS - Seattle, Dallas, and New York Red Bull’s. Kenny had proven success in the league, knew what it took to succeed, and knew what it took during the offseason to give yourself the best chance to come in and make an impact. I also reached out to a few teammates from my Charleston days and had them come out to get some work in prior to their preseasons. Like I said, once you share a dressing room together, whether it be for one season or multiple, you’re friends for a lifetime. From Charleston I would head to Philadelphia to spend a few days with Jimmy McLaughlin to train with him and a handful of other current and retired pros, representing both MLS and the USL. After a few days in Philadelphia, Jimmy, a mutual friend of ours, and I would head to Mexico for a week long much needed vacation. You can’t blame us for wanting to have a week of R&R after a ~10.5 month long season. If you’ve ever taken a trip to Mexico, you know what a week long vacation entailed; but if you haven’t, let’s just say our days consisted of sitting on the beach drinking Pina colada’s. After our 5 day break from reality, I would head back to Raleigh for a few days before heading down to Charlotte to spend time with my brother. This trip was similar to my Charleston trip in many ways. I was going down to train while also enjoying my free time away from soccer. I was able to meet up and spend time with many childhood friends as well as catch both of my favorite teams play - the Carolina Panthers and Charlotte Hornets. I would head back to Raleigh a few days before Christmas to spend the holidays with my family and train with a few other pros, most of which were NCFC guys before returning back to Cincinnati in early January. Once I got back to Cincinnati, it was go time. All my focus was on the year ahead. I got back and immediately started training with whoever else was in town prior to official start to preseason. And just like that, even though my offseason was filled with lots of travel, it was back to work. Hope y’all enjoyed my “abbreviated” summary of an offseason. I’ll hopefully have another submission here shortly on preseason and the beginning of our 2019 MLS season. Lastly, if you’ve made it this far and have a topic or subject that you would like for me to expand on, please don’t hesitate to reach out. You can message me on here at FaithFamilyFutbol.com or connect with me via Twitter @folasso. As I started working on this entry I realized I haven’t posted in quite some time... and for that I apologize. Might be a bit obvious, but I’ve been a tad busy recently and needed to put all my focus into my game. I probably should also go ahead and apologize for what’s next because while I acknowledge the point of these posts is to offer an inside perspective of the day to day life of a professional footballer or offer insight on a topic that’s weighing on my mind, this post is going to be rather short and much simpler. I first want to thank everyone that continues to follow FaithFamilyFutbol! When I started this website, I didn’t necessarily have any expectations other than to share what was on my mind and in my heart. When I began my professional career 4 years ago I noticed there were very few players that publicly expressed their faith, and while to each their own, I wanted to share mine. I wouldn’t be where I am today without God’s blessings and the unconditional love and support of my family and I wasn’t afraid to share that with the world. I am extremely excited to inform y’all that FaithFamilyFutbol.com is now officially one year old! Truth be told, I feel like it was yesterday. I can remember sitting with some of my closest friends constructing the layout of the website and thinking about our objective and what was the point to it all. At first it’s purpose was what I said above, to share my experiences and blessings with everyone, even if it was via a simple post online. 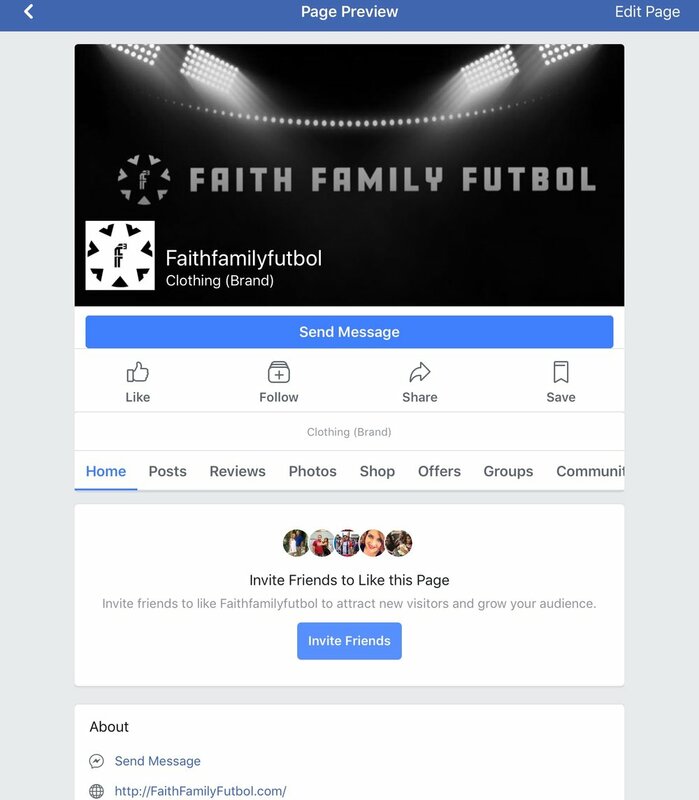 However, a few months later FaithFamilyFutbol had its own Facebook page and Instagram profile and while this still blows me away, FaithFamilyFutbol now has its own apparel! 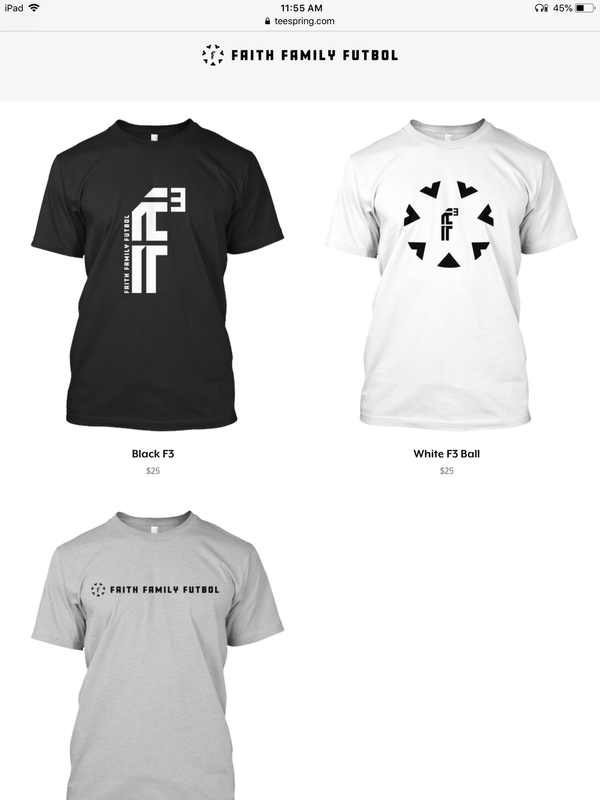 If you check out https://teespring.com/stores/faithfamilyfutbol you can find the first batch of T-shirt’s! I’d also like to note that a portion of the proceeds will be donated to the Special Olympics and will help aspiring athletics with intellectual disabilities discover and strengthen their love for their game! Again, I want to thank everyone that has followed FaithFamilyFutbol and I promise I will have another post here in the near future about life on the pitch. 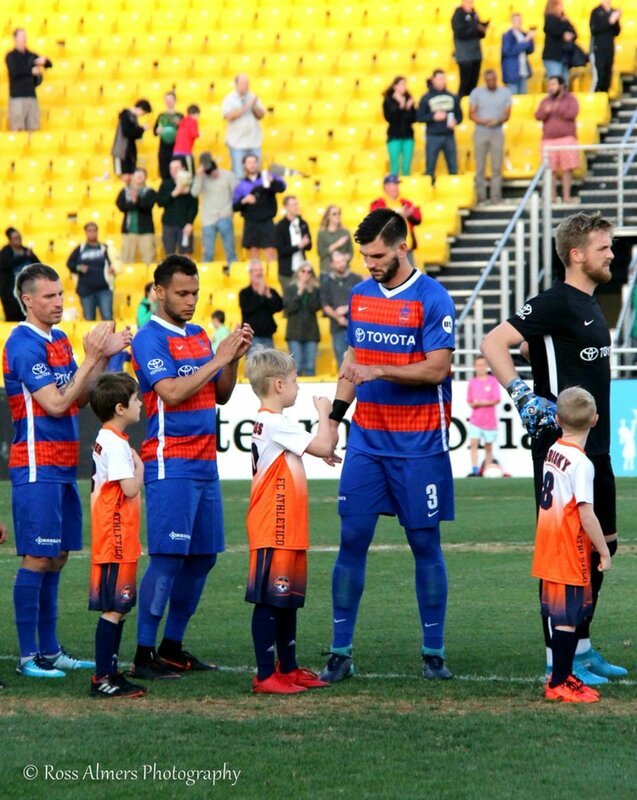 For those who aren’t part of the FC Cincinnati faithful or follow me personally, we had a second week bye this past weekend and after enduring the dreadfully boring offseason, a second week bye could have been deemed cruel and unusual punishment for all of us... not to mention that after making history in week one with a big result on the road against Charleston, we all wanted more league action. 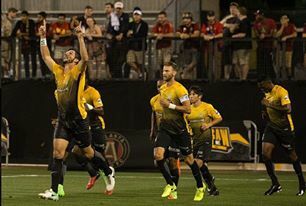 However, coming back home with 3 points and having 2 weeks to prepare for our next league match against Indy Eleven presented many positives as well. The most obvious being time to rest and recuperate. Whether it’s a serious injury picked up during a match or a minor knock during a training session, having time to nurse those knocks is extremely beneficial. Second, and arguably the most beneficial, a bye week gives us more time to prepare, train, and perfect our imperfections. In a perfect world, teams aim to conclude their preseason in match form and while I wouldn’t say we weren’t prepared for our season opener, I also firmly believe that every day, every training session, every match is an opportunity to improve, a chance to get better. 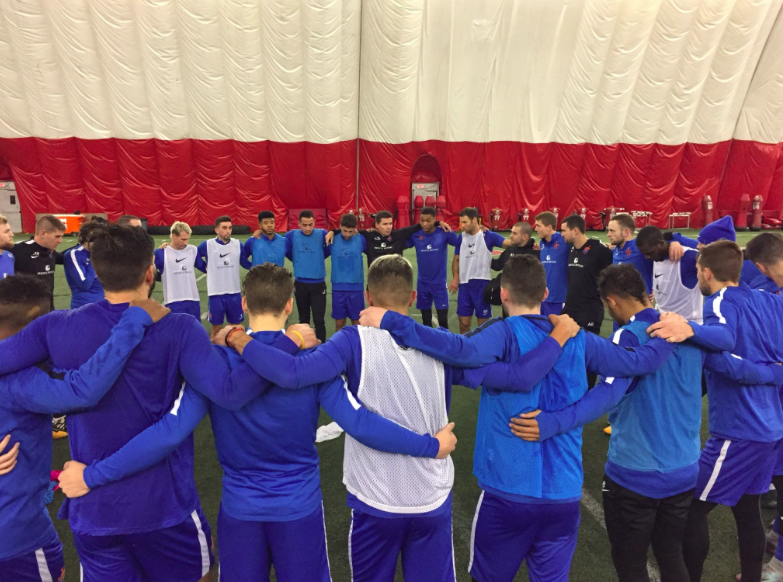 With that being said, an extra week of training without a league match allowed us to focus on implementing and playing our system/style of play correctly. 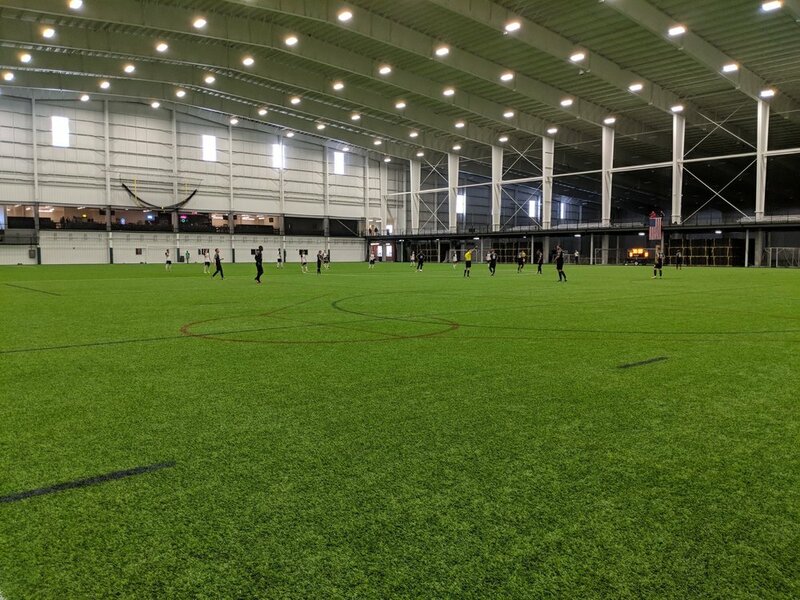 Furthermore, we had the opportunity this past weekend to travel to a Columbus to play a friendly against the Crew’s reserves at their training ground. While what I’m about to say may contradict my first point with the whole resting/recuperating aspect, maintaining match fitness and playing in match-like conditions is very important this early in the season. One challenge was having to travel to Columbus verse staying at home. Most of y’all probably know this already, but playing on the road presents different variables than playing at home. Additionally, we were playing against an MLS side with great quality. While getting the result wasn’t necessarily our main priority, we were going to Columbus with a chip on our shoulder. Columbus, even though a league above, is our in-state rival and we wanted to remind them of such. For those who weren’t able to follow along on twitter, considering the match was held behind closed doors, we walked away with a 4-2 win. We were able to get everyone on the squad minutes but most importantly, continued to approach the next week of training with some momentum as we prepare for Indianapolis this weekend. I told myself before going down to IMG Academy for preseason camp that I was going to have a post recapping our time in Florida and the progress we made as a team as well as myself individually. However, that obviously didn’t happen. And while I know the main point of these entries is to offer an inside look at the day to day life of a player, I also strongly believe that some things, if not many things, are to remain in house so you’ll have to excuse me for keeping some parts secret. You’ll also have to excuse me for jumping ahead a few weeks and bypassing the friendly against Indy Eleven. There was plenty to take away from that game and plenty to write about but I’ve had something heavier weighing on my mind that I feel inclined to elaborate on. Yesterday was one of those days. For all the athletes out there, it was one of those days where you’re good 9 out of 10 times, but that 1 mistake you make over shadows the 9 times you were decent. It’s awfully cliche, but for me personally, my biggest flaw is being a perfectionist. Not just in soccer, but in everything I do. At the end of training yesterday I found myself not necessarily displeased with my performance but rather disappointed that I had let my mistake(s) become all I could think about - the perfectionist in me. However, within seconds of walking off the pitch, my entire mentality shifted directions. Yes, I was still upset I made mistakes, that’s normal, that’s the competitor in me, but once I walked into the locker room, I was grateful those mistakes happened. I was excited I wasn’t “good enough.” I was excited because I saw those mistakes as an opportunity to get better, an opportunity to learn, a chance to improve. His response came hours after training, hours after I had already watched the film from the session and broken down and analyzed exactly where and how I messed up, hours after I had accepted the day for what it was - an opportunity to learn. But his response resonated with me further - it went bigger picture. It went beyond just me and my rough day at training - it brought me here, writing to y’all. I may be young and still very much new to what life may throw my way, but I find that we, as humans, routinely find ourselves harping over our mistakes. Routinely saying, well, it could’ve been or should’ve been this or that. And while I’m as guilty as the next, I write to y’all today to challenge each and every one of you to break that stigma - the idea that we have to be perfect. We will never be perfect. We can only strive for perfection. I challenge y’all to accept your mistakes for what they are, to learn from them, to become better because of them - to keep striving because of them! Much love and keep striving! I usually have an easy time finding a clever way to start these entries. Well, actually, I typically just apologize for the delay in getting something posted. However, it’s only been a handful of days since my last entry and for as creative as I think I may be, I can’t seem to find an opening that I like - so we’ll just jump right into it. Week 2 of preseason has concluded. This week was our first full week of training. As many of y’all already know, we started preseason here in Cincinnati on the 15th. However, we didn’t have our first training session until the 17th. Just like going to the first day of school, the first few days aren’t too rigorous. For us, we had opening meetings, tours of the facilities, introductions to the staff, etc.. I think I can speak for the squad when I say that the difference between school and playing professional soccer is that those first two days were the longest two days of the offseason. If you ask any professional athlete, the offseason is dreadfully boring - all we want to do is get back to it. For most of us, we have 4-6 weeks of an offseason. To many, that’s no time at all. For me, it felt like eons. So similar to running a race, the final stretch is always the toughest part. We were in Cincinnati, the squad was finally all together, we were settled in, but still not officially training. It was in my opinion, one of the worst forms of torture out there. It was almost like waking up on Christmas morning as a little kid and wanting to rush to see if Santa came but instead, being told by your Mom to wait at the top of the stairs so that she could take pictures, make sure breakfast was ready, and that everything was just right. But eventually the gate would be lifted and we’d be off! Monday morning, week 2 - it was go time. We were entering our first full week of preseason. We knew the ins and outs, we had started to get our bearings, and it was time to start making progress! Week 2 was great - everything we wanted it to be! We would have days with futbol only sessions, days with futbol and gym sessions, days with only a boxing session, and days for recovery/wellness. A full week to say the least. If you follow FC Cincinnati on Facebook, Twitter, Instagram or just online, you more likely than not already know what we’ve been doing. If not, I’ll share a little bit about the process. Monday, outdoor futbol only session. Tuesday, outdoor futbol session with an indoor gym session following. 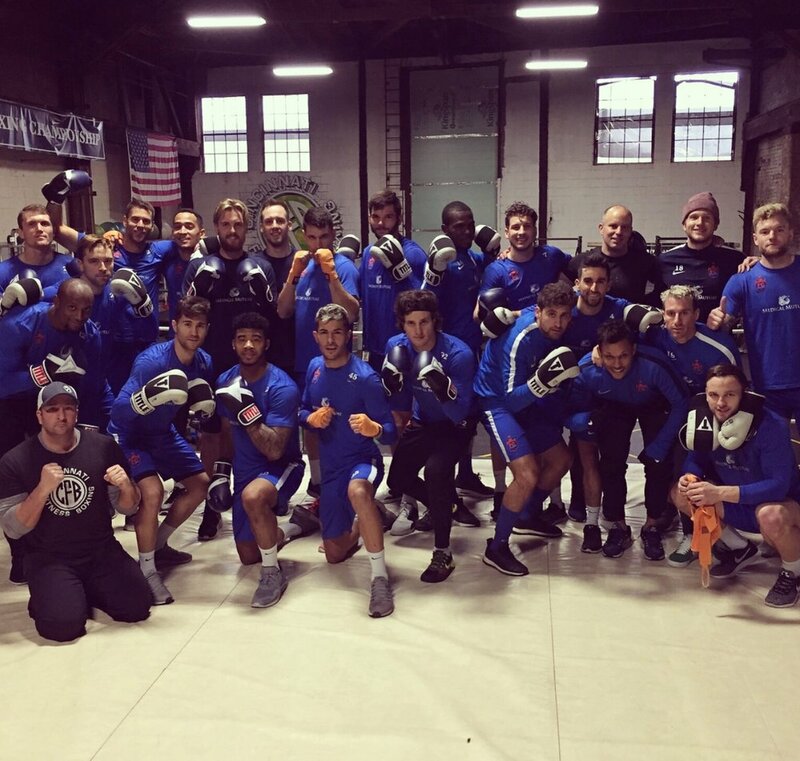 Wednesday, boxing session with the guys at Cincinnati Fitness Boxing. Thursday, outdoor futbol session. Friday, outdoor futbol session with a gym session following. Lastly, Saturday, recovery/wellness. I’m not going to go into much more detail on the sessions, that’s VIP information and something that frankly, stays in house. I do however, want to share a few things that have happened off the pitch. Monday afternoon was my first opportunity to connect with some of the youngsters in the Cincinnati community and I absolutely loved it! After training on Monday, two teammates and I, Nazmir Albadawi and Tyler Gibson, had the opportunity to spend the afternoon with the kids at Pleasant Ridge Montessori during an after school Futsal program. This was my first time interacting with the youth in my new home and it was exactly that - I was at home. 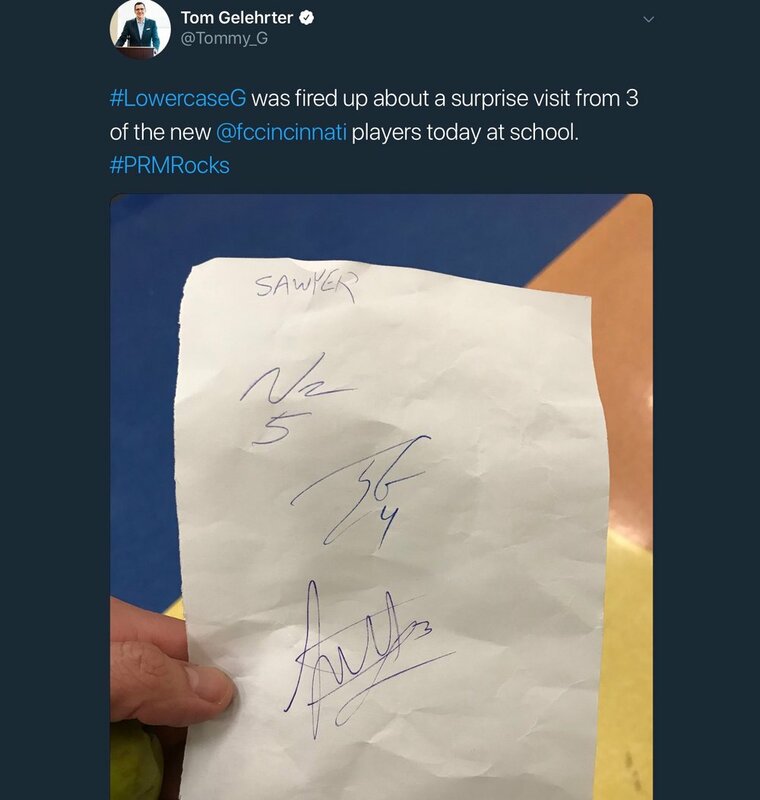 We introduced ourselves, hopped in on the drills and scrimmages, and as always, answered some “quality” questions afterwards before signing autographs. It was short, it was sweet, but it was perfect. I can remember as if it was yesterday, admiring older soccer players. Some may have been middle school players, some may have been college players, some were professionals who I had never met, some were players I simply saw on tv; but they were my heroes. They had it all. They were everything I wanted to be. They were living the life! I’ve been blessed to be able to do what I love everyday and I wholeheartedly believe I am where I am today thanks to the role models and heroes I had as a kid and whether I realized it when I was in high school, or when I was at Wofford, or when I was in Charleston, I was someone’s role model somewhere. Everything I did, everything I said, every move I made, someone was watching. It didn’t matter if it was one kid, one parent, or one friend, someone was looking up to me - someone wanted to be me. Realizing this was one of the greatest gifts I’ve been given - the opportunity to inspire. The chance to show them that their dreams can be achieved. The chance to teach kids the right and wrong way to go about it, but more importantly, the chance for me to learn. The chance for me to learn how to live the life The Lord wants me to live. The chance to perfect my imperfections. I am by no means perfect, never have been and surely never will be. If there is anything I’ve learned over the years, it’s to never give up and have faith. Have faith that the noes will eventually become yeses. Have faith that the bad times will eventually become good times. Have faith that the impossible, is in fact, always possible. Although I’ve seemed to steer away from the futbol, I haven’t. Futbol for me is more than just a game. It’s everything - it’s my life. It guides my faith, it’s my family, it’s my chance to give back to all of those that have given to me - and that’s something I plan on doing each and every day! I’m looking forward to taking more steps forward as we enter week 3 and sharing my walk with y’all again. 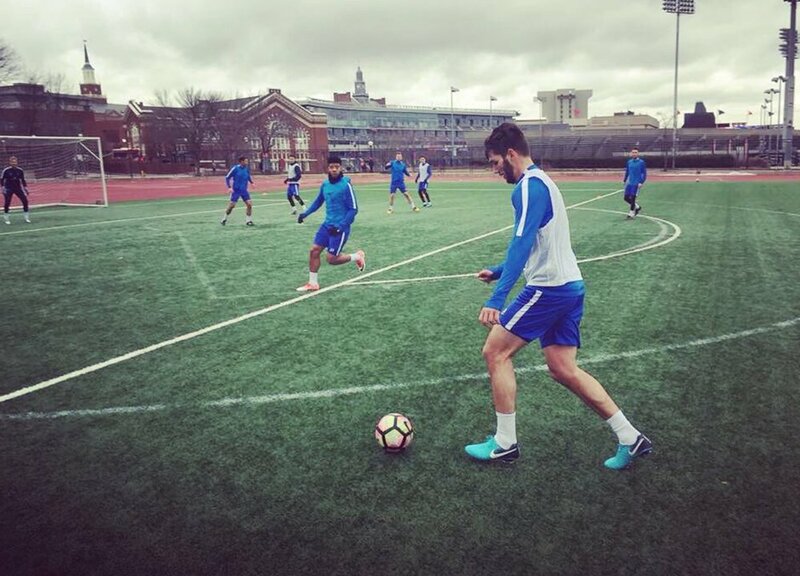 As many of you already know, I signed with FC Cincinnati back in November. Before getting to present day, quick recap. I was fortunate enough to be able to return back home to Raleigh for the holidays, and for those who know me, meant everything to me. My family means the world to me. It’s cliche, but cliches are cliches because they're accurate and as the saying goes, you can pick your friends, but you can’t pick your family. Well, even if I got to pick my family, I would choose my parents, Cullen, Sarah Grace, Sutton and Manning EVERY SINGLE TIME! I was able to spend roughly 7 weeks at home before reporting to Cincinnati. At first, most people thought I was crazy. I left the nest back in 2011 to attend Wofford College and immediately submerged myself into the professional life in January of 2015. I was able to make it back home for Thanksgiving and Christmas every year, but that was only for a few days at a time. But going back to what I said above, my family is everything to me. When I realized I had this 6-7 week window of down time with no real responsibilities, I knew right away what I wanted to do - I wanted to go home. My two youngest brothers are 12 and 14. I wanted to support them like they've supported me all these years. I wanted to be at every practice, at every game. I wanted to show them that while I am doing my own thing, I was still and will forever be their number 1 fans. My sister Sarah Grace, a sophomore at Ole Miss, was also going to be home for winter break and I wanted to seize every possible opportunity to be with her; whether it was just laying around watching tv, running errands, or getting pedicures. I also wanted to “kick it” with my best friend, my homie, my dude, my brother. Cullen is currently working in Charlotte and while I was lucky enough to share many memories with him while in Charleston, I hadn't seen him in his element. I wanted to visit him in Charlotte, I wanted to see him in his world. I wanted to be there to support him in all of his endeavors. Best part about it all, we were all home in Raleigh for the holidays. The family was reunited, for the first time in a LONG time, and it was absolutely incredible. Lastly, I wanted to see my dog, Copper. If he could read, he’d probably be very upset if I left him out so there’s his shoutout. It’s repetitive and I apologize, well, not really, but my family is my everything. However, family for me extends past my immediate family. While I have been truly blessed to have the best, coolest, funniest, most entertaining family of all time, I’ve also had the pleasure of having another family; my soccer family. Whether it was for just one year back when I was a kid, or 4 years at Wofford, or 3 years in Charleston, or only a few days here in Cincinnati thus far, my soccer family is something I will always treasure and hold close to my heart. We are just a few days into preseason here in Cincinnati and still getting to know each other, but I love this family. It’s hard to really express what I am feeling, but if I had to put it into words, I’m thankful, I’m grateful, I’m excited. I’m thankful to be apart of such a special group of guys. I’m grateful for the blessing God has bestowed upon me by allowing me to be able to continue to do what I love everyday. And lastly, I’m excited to go to work each and every day. I’m excited to go to battle every day for the guys beside me, the community that supports us, and the Cincinnati family that loves us. I will try to post again here soon, but for now, it’s time to go to work; it’s time to get better. 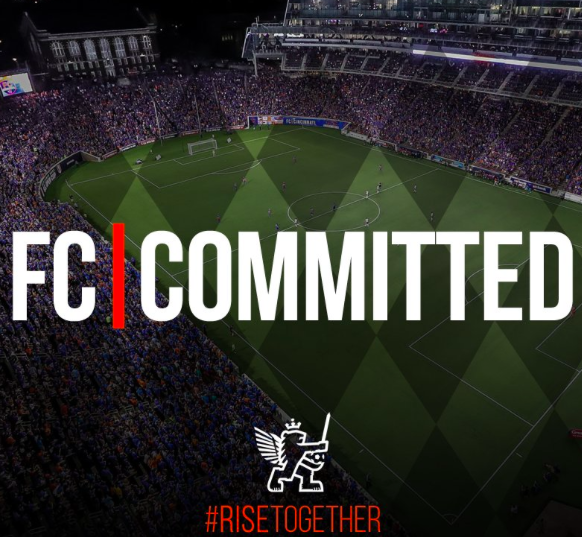 It’s time to #RiseTogether! If you’ve been following FaithFamilyFutbol and my #dreamchasing journey, you can go ahead and skip to the next paragraph, but if this is your first time reading, or you just need a refresher, I started playing soccer when I was roughly 3 years old. My parents didn’t grow up playing and essentially knew nothing about the game until I started playing. I played my first few years for The Salvation Army before wanting to play in a more competitive environment. My first “real team” was The Express, a recreational CASL team that primarily consisted of friends of mine in the neighborhood. If you follow English soccer, The Express was like your local pub team - a team that consisted of players who lived in the neighborhood, who loved the game, and whose talent ranged from top to bottom. It was soccer being played in its truest form, for fun. A few days ago, I was at the gym and bumped into a family friend. I was headphones in, in the middle of a set, and this older gentlemen who I didn't recognize, thought he recognized me. I only say that because I found myself locking eyes with him 3 or 4 times in between reps. We eventually introduced ourselves and I should’ve known that if someone recognized me in Raleigh, it was probably because they knew my parents or one of my siblings and sure enough, his older son played lacrosse with my brother Sutton a few years back. We got to talking and ended up talking about how he and his other son had been following me since my Wofford days and knew what I had been up to since. He told me that his youngest son, Jared, loved the game. He asked if I ever did individuals or lessons and if Jared was old enough? With a little chuckle, I answered, “absolutely!” I started playing when I was 3 years old, I grew up with 4 younger siblings and have been essentially baby-sitting my whole life. If you love the game and are old enough to walk, run and kick, you’re old enough to play in my opinion! So… we ended up exchanging information and found a day that worked for both of us. That day was today. One of the coldest days of the winter thus far in Raleigh… But unless its lightning, there’s really nothing else that could keep me off the pitch. As for a third grader, well that’s a different question… but we trained so we’ll let that speak for us. If you made it this far, you probably are wondering what’s the point to all of this rambling. Well, I met Jared today where it all started for me. Back when I played for The Express, we practiced at Banbury Park here in Raleigh. There’s nothing special about it. There’s a play area for kids, a walking path for adults, and a field with a few soccer goals. Today though, everything about it was special. I got to train on the field where I first trained. I got to share my love for the game with a futboler from the next generation of players. I got to give back to the community that raised me and best part about it, I got a fan for life! Days like today are what make it all worth it! The meaning to it all. For my past three professional seasons I’ve written “F.F.F” on the tape that covers my wristband on my right arm; the wristband story is for another time. “F.F.F” which obviously stands for Faith, Family, Futbol, has been everything to me since my very first days of playing competitive soccer. When I was in middle school, playing competitive soccer for the first time, on a team that had been playing together already, saying I was nervous would be an understatement. I loved playing, it meant everything to me. I was the “new kid” on the team; I knew I could play, but I had to prove myself. I admired all of my teammates; we were only in middle school but this team had already proven themselves. They had won all the trophies, titles, tournaments, and the most intimidating part, they travel all across the US doing it. 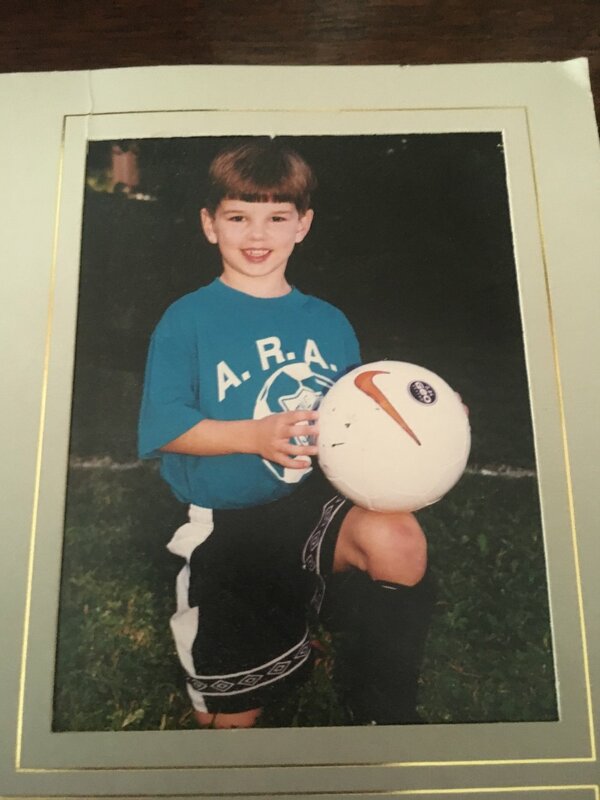 I was just this little kid who liked playing soccer and just wanted to keep getting better. Two of my first coaches playing for CASL during my middle school years did an excellent job coaching as well as teaching. It probably didn't mean as much then, but sitting here today, I’d like to thank both Coach Lambe and Coach Talbot for everything they did back then. Whether you thought we were listening or not, we were, and y'all's wisdom is something I’ve carried with me my entire career. It was just an average day of training. I’m sure we were goofing around or not taking whatever drill coach was running seriously, but it was another day in paradise none the less. I can’t remember the exact day, but I can remember being called into a huddle on the first day of training and Coach wanting to lay out the “guidelines” for how we were going to operate. Three things he said. Only three things mattered. Your faith, your family, and soccer (futbol). Your Faith was first. Nothing came before your faith. It didn't matter whether you were Christian, Muslim, Buddhist, Atheist, or anything in between; your faith was first. Your family was second. Your family has always been there and will always be there for you. Your faith was first and your family was second. Soccer was third. We were there to play soccer. We were there to get better and win. We set the standard high and accepted nothing less. We were just middle school kids, but this was business for us. So recap… Your faith was first. For me, I wouldn't be here without God’s graces and as my Dad shares with me and the rest of my 4 siblings, “Seek justice, love mercy, walk humbly with your God” - Micah 6:8. Your family was second. My family is everything to me. They’ve picked me up when I’ve fallen and celebrated with me when I’ve succeeded. I wouldn’t be here without them and damn sure wouldn't have gotten here without them. And lastly, soccer was third. Soccer was the “most important.” There was no excuse to miss soccer. There was no excuse for not giving your all. You were never allowed to miss soccer unless it was for your faith or your family. Clear and simple. So…the years moved along, we grew older, coaches changed, but that one speech that one day in the huddle stuck with me. My faith was first, my family was second, and soccer was third. The clock kept ticking and I was finally at Wofford. I was living a dream. I was playing college soccer! I had no idea there was another chapter afterwards. I’ve always been a simple or old fashion player when it comes to accessories or gear. No tape, no long sleeves, no gloves, none of that. However, I started wearing a wristband on my right arm for one of my teammates, meaning I would have to tape over it in order to wear it while playing. That story will come later, but I’m superstitious; I had success with the wristband on so I kept wearing it. I arrived in Charleston my rookie year still wearing the same wristband. I had achieved a lifelong dream of playing professional soccer and I would not have done it without my faith, my family, and my love for the game. So prior to my first game professionally with the Charleston Battery, I taped my wristband and wrote “F.F.F.” on top of the tape to remind me what was important, what mattered most, but most importantly, to make the most of the opportunity God had blessed me with. If you follow me on social media, you probably don't need to read this considering you've seen it.. but I’ve had a handful of people ask me how I was going to train during the offseason with my transition between clubs. After my rookie season I moved back to Spartanburg to finish my degree at Wofford before heading back home to Raleigh for Christmas. I’ll get to this chapter of the #dreamchasing journey later, but while in Spartanburg during that offseason, I was hired as an assistant coach for the Wofford Men’s side. I was able to train daily with the squad which at that time still had a handful of players I played with during my time there. I would end up moving back to Charleston for my second season the second week in January and would train with other teammates already under contract and/or in Charleston for the next 3-4 weeks before preseason officially started. After my second season with the Battery, I stayed in Charleston during the offseason. There were a handful of guys in town who were still under contract so from December until February, we would play and train both indoors and outdoors. So, to finally get back to this offseason; I was coming home. After our season ended, I had roughly 3 weeks in Charleston before heading back to Raleigh. During those 3 weeks in Charleston, I trained at The Bar Fitness Club in Summerville. I was lucky enough to have a roommate who went to high school with the owner and therefore, got the VIP hook up on a professional facility just down the street. Coming back to Raleigh to train was where things would get interesting. I’ve been in Raleigh for about 3 weeks now and have trained everyday. Best part about it, everyday’s different. I was lucky enough when I was younger to grow up a member of North Hills Club, family oriented pool, tennis, and athletic club. It was great during the summers as a kid but once I grew up, graduated, and went off to Wofford, I rarely was in Raleigh, and when I was, it typically was over the holidays, so there wasn't much use for an outdoor pool. But the fitness room/gym on the other hand had top notch equipment and was just a few minutes down the street from my neighborhood. So… I’m in the gym everyday. Again, if you follow me on social media, you're probably rolling your eyes. The facilities at North Hills have everything a professional weight room has. From treadmills, to free weight bench/squat, assisted-free weights, machines, and one of my personal favorites, the yoga studio; which for me is an indoor speed/agility room with the weekly yoga session. If you've made it this far, I’ve got ya, so I’m going to explain something real quick… I grew up tiny. I was the smallest of all my friends. I was athletic, I was scrappy, but I was the smallest and definitely the weakest. I was 5’6 when I was 16, 6’1 when I graduated high school, 6’4 when I left Wofford and now sitting just shy of 6’6. We’ll get to it in #dreamchasing, but I was cut from numerous teams and used that adversity as motivation. I truly believe I got to where I am today because of every one that told me I couldn't or can’t. As soon as I heard that, I essentially wanted to thank them for doubting me, because I was just going to turn around and prove them wrong. Before coming down off my pedestal, there’s a BIG difference between a gym rat and a kid who had a dream, lives his dream everyday, and never wants to lose, therefore, in the gym every day during the offseason because his only priority is getting better! So on top of going to the gym everyday, I was lucky enough to come across quality pick up and training. I was only back in Raleigh for 2-3 days before I got a text from a buddy of mine who has been playing professionally for the past handful of years here in Raleigh. He told me about how handfuls of his teammates at NCFC and some other pros from other clubs in the USL and NASL were in Raleigh for the offseason, and were going to try to meet up 2-3 times a week to train and play. I was all about it! Cool little side note, we have been playing at the complex where I grew up playing. Small world, but not really. So right now I’m hoping I’ve painted a decent picture of what my days look like during the offseason. It’s pretty simple. I wake up, eat breakfast, walk my dog, and then either go train before going to the gym or I just go to the gym. On days where we don't train, my little kid comes out as I have to get some touches on the ball. This is where it gets fun. I’ve only been to 3 different fields as of now, but on days where we don't play pick up, I’ll go about my morning routine, go to the gym, and then drive to just about any field in Raleigh that has goals and that I can get on. I’ll usually spend an hour or two just getting touches; dribbling, juggling, passing shooting. People are going to hate, they always have and they always will. We wish it was different but it’s inevitable. For me, I love everything about hate. I love when people hate on me. I love when people talk trash. I love when people say I can’t do something. I love when I’m underestimated. Don't get confused, I’m not doing this for you, I’m doing this for me and my family. So keep hatin’, because you're just throwing fuel on my fire. It's been a while… You would think that with all this new free time I would have posted a couple times before now… After our season ended I ended up being a lot busier than expected. So… after those 8 days, I had a few responsibilities before I could head home for Thanksgiving. You have to remember that since the season started back in the beginning of February, we didn't have a weekend off until November. Once our season ended and I was able to look at my schedule and there were 2 events that were a MUST for me. The first was Wofford Basketball’s season opener against South Carolina in Spartanburg. Not to mention this was also the first game in the new Jerry Richardson Indoor Stadium. If you haven't heard about it or seen it, take a minute and look it up; it’s truly spectacular! The second event was 2 weeks later in Columbia where Wofford took on South Carolina in football. Unfortunately neither result went our way but it was still amazing to to be able to go back to campus, see some old faces, and then see the boys play on the road. It had been over 14 months since I was able to be back on campus and/or see the Terriers in action, so I was going to make it happen. On my way out of Charleston, I would make one more stop before heading home. I stopped in Charlotte for 2 nights to spend some time with my brother and some old faces from back in the day that now work in Charlotte, and since I was in town, catch a Hornets game at The Hive! Don't worry, we beat the Timberwolves. I finally would make my way to Raleigh 2 days before Thanksgiving. While I hadn't been back to Wofford in over a year and being able to make it back was special, what was even more shocking was when I sat down after the season, thought about my plans for the offseason, what was next, where would I be for Thanksgiving, December, Christmas, and after some quick math, I realized that I had spent less than 20 nights in Raleigh since I was home for Christmas my senior year of college (December, 2014). It sunk in immediately. I didn't know where my future was taking me just yet, but I knew I had this window of time where I could do what I wanted and I wanted to see my family. My family is everything to me. There are a million cliches about family this, family that, but to me, my family is everything. They've allowed me to grow into the player and man I am today. My parents might not have played the game, but they introduced me to it. I’ve joked about it, but I have 6 of the best fans in the world. There for me day in and day out. I have 6-8 weeks of an off season and I was going home! Best part about it, my only priorities are training and spending time with my family. I’ll upload another post about what training is actually like for me this off season, but for now, I’m going to watch some college football with my family! Peace! It’s been awhile… I had a handful of people ask for a post at the end of the regular season and during the playoffs and to be honest, I was in the zone. After the finish in Charlotte, I planned on posting something, but we got back to Charleston late Saturday night and once I woke up on Sunday, I was locked in - sorry guys. 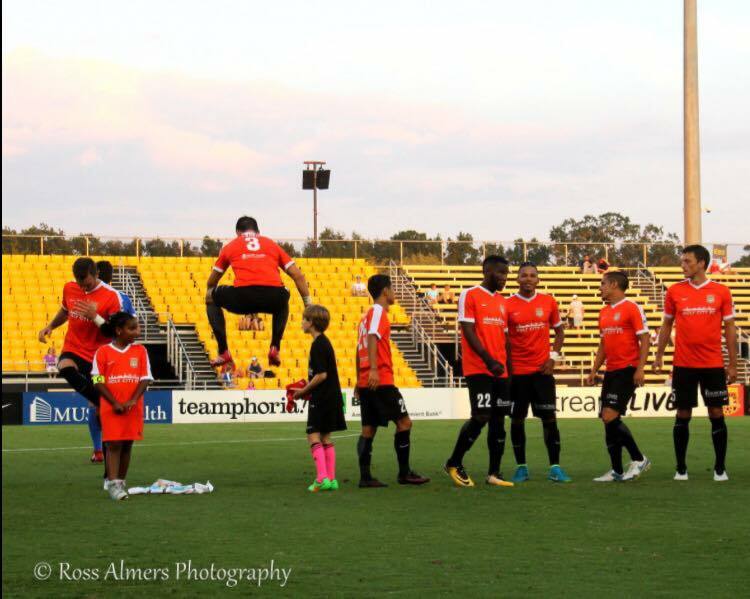 To each and every Charleston Battery supporter that followed us this year, THANK YOU! Obviously, we had a early ending to a spectacular season. 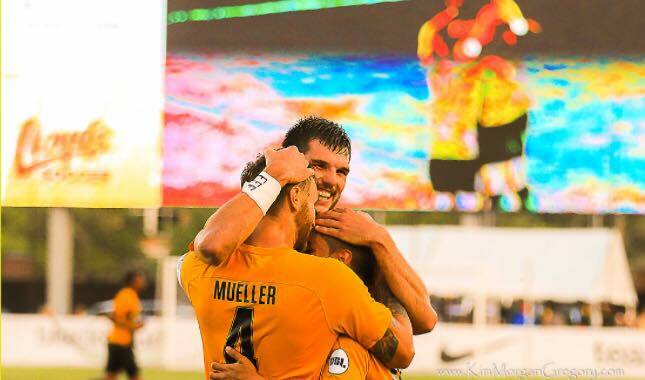 From the hot start at the beginning, to Pavy lighting the league up with goals from the start, to JP being completely lethal all year from set pieces, to Super Cooper making saves we didn’t know were humanly possible, to earning 4 USL All-League selections. We had a hell of a year on the pitch. It took the entire squad, and it showed. We weren't the deepest squad, but every guy had a role, and we shined when we had our moments. But the success didn't come from just us, it came from the fans. It came from the members of Queen Anne’s Revenge, the Regiment, the local youth clubs, the season ticket holders, and even the random traveling tourist in town for the weekend. No matter who you were, or how much you cared, if you supported us, thank you! We couldn't have done it without you. Before you start reading, I feel inclined to warn you. 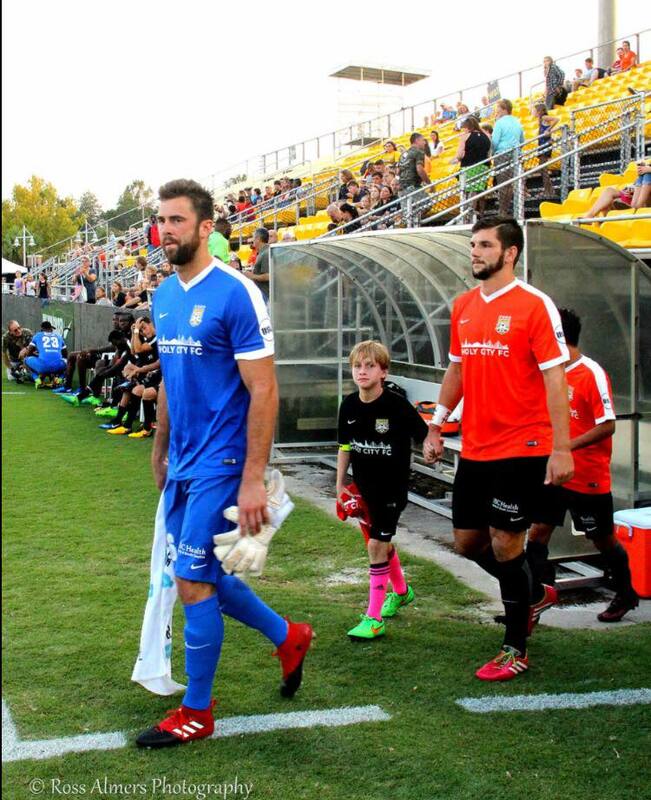 In my previous post I have either written about #dreamchasing and my soccer journey thus far in my life, or either random inside looks at life as a Charleston Battery player. I was in the middle of writing this post, had a million thoughts a minute, asked for a little advice and after a little help from one of my good friends, the idea “flowin’ with Fo” was created - shoutout Taylor Darling. So for future reference, post titled with #flowinwithFo will be a little…very random. Earlier today I was scrolling thru Twitter and saw a tweet that asked: “When teachers wake up in the morning, do they go to work or to school?” I thought it was funny enough to share, so I asked my roommates what they thought - they both said work. They flipped the question and then asked me whether I go to work or practice every day. “Neither, I go to training. I don't consider what I do work” was my answer. The conversation fizzled out pretty quickly but I couldn't get what I said out of my head. I answered without hesitation, kept chewing over what I just said, had an idea, and then boom, here we are. I love what I do every day. I’m eternally grateful for the opportunity that God has blessed me with; but what’s crazy is that after 19 years of playing this sport, I still can’t tell you why I love this game as much as I do. You would think I could at least come up with something more than just “I love what I do every day.” Trust me, I wish I could too. Instead, it’s as if I am broken robot who just repeats the same phrase over and over, stuttering between words, essentially saying nothing at all. May seem silly, but when thinking about it, not being to explain it, actually explains it perfectly. It didn't matter whether it was a pick-up game in my neighbors front yard one afternoon, or at recess during elementary school, or a high-school or college game; I loved every chance I got to play. I loved every thing about the game. If I wasn't playing, I was thinking about playing. It’s all I wanted to do - but I’m not perfect, no where near it. I have to admit that during my 19 years of playing this sport, I’ve made my mistakes; but I don't believe I would be here today without them. I was young, immature, selfish, and honestly probably the most appropriate, just flat out stupid; but I honestly believe that in order to succeed tomorrow, you must first learn from your failures today. I love this sport. I love being able to play everyday. I know there will inevitably be a day where I can’t play and even though that’s enough in itself, I’d be naive not to acknowledge that few people are given the opportunity that I’ve been presented with and I’d be a damn fool to take it for granted. I want more. I’d be lying if I said I was content. I’ve had a taste and now I want the whole thing! I’m going to learn from today and fair warning, I’m coming for tomorrow. If you follow me on twitter, you've probably seen me use the hashtag “#OnceAPupAlwaysAPup.” It’s probably obvious, but it’s Wofford related. Someone somewhere may have used it before, but after graduating from Wofford in 2015, I started using the hashtag to label my social media post that dealt with Wofford, Wofford Soccer, and/or my time there. There were plenty of hashtags that the school’s media department had in circulation already and each athletic team of course had their own saying or phrase, but the Men’s soccer team during my time decided to mixed things up a bit and instead of Terriers, or T-Dogs, we broke down huddles with “T-Puppies” or “T-Pups.” That explains the Pup. The rest of it is actually pretty simple. Wofford is small - one of the smallest Division 1 schools in the nation; roughly 1800 students. We may have been small, but we had a big heart. It’s corny, but like President Eisenhower once said, “What counts is not necessarily the size of the dog in the fight - it's the size of the fight in the dog.” Wofford was small, our student body was small, we were the smaller dog in a big dog fight. It doesn’t matter what year you graduated, what team you played on, what greek organization you may have been a part of, if you were a Wofford Terrier, you were a part of a family - a family that would last forever. Having the opportunity to pursue the thing I love most after college was a dream come true. Having the opportunity to pursue this dream in Charleston was another blessing in itself. I could write for days on the wonders of Charleston and why it’s so amazing but there’s been one part of this experience that has made my time here in the Holy City extra special. During my time at Wofford I felt as if 1 out of every 4 students was either from Charleston or had some tie to the low country. I can remember making handfuls of trips to Charleston during my 4 years. Of course we came down for soccer games, but I also remember coming down for handfuls of weekend getaways or night trips for athletic events or what have you. Charleston may have been 3 hours down I-26 from Spartanburg and subsequently the home of one of Wofford’s long time rivals, but Charleston, even during my college years, felt like my second home. Little did I know that Charleston would actually become my home. The NCAA released an article earlier this year talking about the estimated probability of competing in professional athletics after competing in collegiate sports. The NCAA estimated that out of roughly 25,000 men’s soccer participants, roughly 80 players will go on to play professionally - that’s 1.4%. Probably obvious, but Wofford hasn't produce as many professional athletes as some of the other Division 1 schools. For the few of us Terriers that have had the opportunity to compete professionally, regardless of sport, there’s one thing we all have in common - our love for our school. We want to put Wofford on the map. We want the world to know who we are. I wouldn't be where I am today without Wofford, the Wofford family, and everything I learned during my time in Spartanburg. So when I play, part of me plays for Wofford. Not just for the school but for everyone that went to Wofford, every athlete that put on the olde gold and black, every Terrier that walked thru the gates - and there happened to be tons of them in Charleston. There’s this one Terrier that I’ve had the pleasure of getting to know over the past season, well, technically future Terrier considering he’s still not a teenager, but with his parents both being Wofford alum, he was born into the family, at least for now, who has taught me more about myself than I taught him about soccer. For about 12 weeks this summer I, as well as handful of other Battery players, coached weekly soccer camps and clinics at our facilities for local youth soccer players. I was responsible for coaching 20 or so 8-10 year old boys and girls and one little guy in particular made an impact from day 1. He never complained, he was always excited for what was next, he wanted to learn, he wanted to get better. He loved soccer and it was as obvious as it was me quoting Eisenhower after talking about Wofford being the small dog in a big fight. This little dude showed up every week for 12 weeks more excited than I can explain. He reminded me of myself when I was younger. It was as if I was coaching a younger me and the best part about it, he was all about some Wofford Terriers. 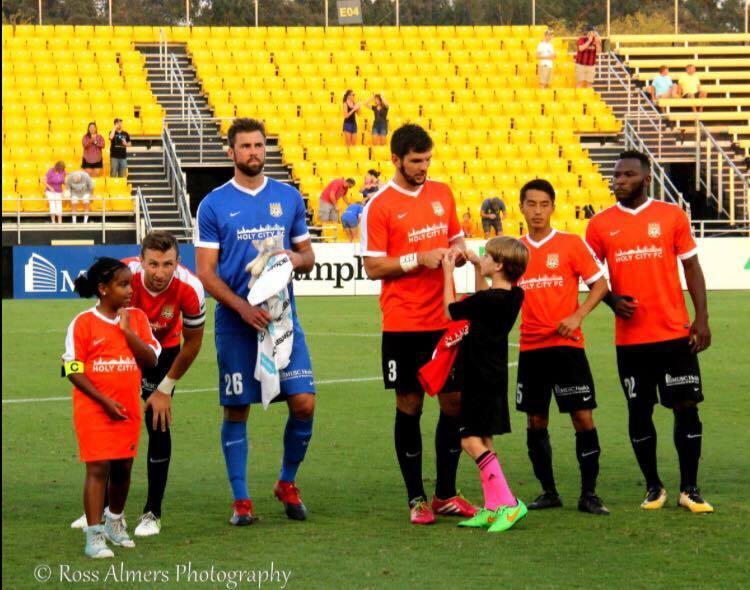 This past Saturday we played Richmond at home and Luke was our honorary captain. Luke got the opportunity to hang out in the tunnel prior to kickoff before walking out onto the field with the team. I was able to meet Luke’s parents earlier in the summer and even though Luke was a little too shy to admit it himself, Luke’s parents told me how much he looked up to me - how he dreamed of being in my shoes. He wanted to play soccer at Wofford, he wanted to play for the Battery, and to ice the cake, I was his coach doing exactly what he dreamed of doing. We all can remember those days when you would go to school and brag to all your friends about some famous person you met and how he/she knew you. I was Luke’s famous person. What Luke or his friends probably don't know is that not only did Luke know me, I knew Luke. Sure he was just a kid at camp, but regardless of whether I met him once for 12 minutes or got to hang out with him once a week for 12 weeks, I learned just as much from Luke as he learned from me. I can remember admiring handfuls of players at all levels when when I was younger and how cool it would have been to have had a personal relationship with one of them. I knew that even though hanging out in the tunnel and walking onto the field was already going to be very special, that I could do something that could make it a little bit better. I met with our equipment manager earlier in the week and had him create a one of a kind jersey that I would have the squad sign for Luke. Walking out of the locker room into the tunnel and seeing Luke look up at all the players in absolute shock was beyond satisfying in itself. He was starstruck. Little did he know I had something for him. I walked up to Luke, gave him a high five and then unfolded the jersey from my hands and showed Luke the front. Being the devote Battery fan that he is, Luke was already wearing a Battery top, so even though it was a one of a kind jersey, plenty of people had jerseys. I flipped it around and showed him the back that was signed by everyone on the squad. Once he swallowed what was now his, it was if he had lost the ability to speak. His smile was ear to ear and his face blushed as red as a cherry. Luke had made a special impact on me over the summer and I felt as if I owed him a something special too. Something so small, meant so much. It's been a while since we've been at home. We were scheduled to play at home this past Saturday against Charlotte... but Hurricane Irma decided otherwise. It may have been down graded to a tropical storm by the time it arrived in Charleston but the damages were still extreme. I know there were a lot of disappointed people with the game being rescheduled after the beautiful weather Friday and Saturday, but to look out for the safety of the players, officials, staff, fans and everyone traveling, the league and two clubs decided on postponing the match. With Irma scheduled to hit Monday morning and our game being rescheduled, we trained early Saturday morning and to mimic game-like scenarios, we played an inter-squad scrimmage. We would take Sunday and Monday off, allowing players to evacuate or take proper precautions if staying in town, before returning to training Tuesday afternoon. Come Wednesday morning, we would be back on our normal schedule, with a home game schedule for this Saturday! Training was at 10:00 this morning, meaning everyone had to be there by 9:30. Being the early bird that I am, my first alarm went off bright and early at 7:00 a.m. I said first alarm, because I have three. I turn off the first at 7:00, close my eyes for 10 more minutes, turn off the second, lay there for 10 more minutes usually unable to go back to sleep before turning off the third at 7:20. At this point I’m up, but not completely. The first 10 minutes or so is time to adjust. Meaning, sitting up inch by inch, checking my phone for any texts, news, notifications, social media, blah blah blah, before finally kicking off the sheets. I’ll get up, brush my teeth, get dressed and make my to the kitchen to grab something light to eat for breakfast. I’ve never been one to play on a full or heavy stomach but I’d be naive to think that playing on nothing at all is healthier. I mean a truck needs diesel to run after all. Something light typically means an apple or banana and a bowl of yogurt or cereal. Nothing crazy, but something simple and nutritious. The last thing to do is fill up my water bottle, prep my protein shake, and hit the road for training, which is roughly around 8:15. I know I’ve gone over my pre-training or pregame routines before so I’ll excuse me if things get a little choppy but here’s a recap: arrive 8:50-9:00, walk into locker room and immediately connect to speaker, change from street clothes into training shorts, hot tub warm-up/stretch for 8-12 minutes, change into training gear with flats, weigh in, stretch in weight room, medium core workout for roughly 25 minutes, 5-10 minute cool down in locker room, then head out to train at 9:50. We played today at training. That may sound silly to some, considering we play soccer everyday but to those new to the world of soccer lingo, playing means playing small sided, 6 v 6, 7 v 7, etc.. In essence, good ole fashion soccer with no limitations or restrictions. Today we played 9 v 9 with one neutral player playing on the offensive side of the ball. One 9 would mimic Richmond's style of play while the other 9 focused on our own, simulating scenarios we will faceSaturday. After training a few players would hang around the pitch to help the media crew shoota few interviews and videos before heading inside. I would stretch, shower, change and head home. Wednesday’s are my day off. No coaching, no individuals, no nothin’ and if you’re a soccer fan, you know that Tuesdays and Wednesdays during this time of the year are special. We wait all year for Tuesday and Wednesday afternoons and with having no responsibilities on Wednesday, my only priority after training is eating lunch, sitting on my couch, and watching Champions League! And that’s exactly what I did today. I came home, made lunch, sprawled out on my couch, turned one game on one tv, another game on another, and boom, afternoon made. My only other responsibility on Wednesdays are dinner. Luckily for a foodie like myself, there’s a very scrumptious sushi place right near me that has a BOGO special on Wednesday and lets just say that once I found out about the BOGO deal, I’ve taken full advantage of it! As you can see, I didn't disappoint with tonight’s rolls. After dinner, the day’s pretty much over. I’ll chill out for a little bit, watch a movie or two, and then hit the sheets knowing I will be waking up tomorrow at the same time ready to crush it once again! Even though running chaotically around the Salvation Army soccer field, which also happened to be the football field, baseball field, kickball field, recess area, and excess parking lot during basketball games, with 21 other kindergarteners was a ton of fun, I wanted more soccer. I wanted structure, I wanted to compete. Hell, I think I just wanted to play soccer on a true soccer field. I wanted my own jersey, I wanted to be on a team. I wanted to win. I wanted more soccer, but like I said in part one, my parents were relatively new to Raleigh, neither one of them played soccer growing up, neither really knew anything about it nor did they follow it, and to ice the cake, I was their first kid. So you should understand me when I say youth soccer was unchartered territory for the Lasso’s. After 2 years of soccer at the Salvation Army I would join a CASL recreational youth soccer team called The Express. CASL, Capital Area Soccer League, was a youth soccer club in the Raleigh-Durham area that just recently became North Carolina FC. I’m sure I could ask my parents how and why they chose CASL and The Express, but I’d rather tell you what I can remember. To help explain the level of soccer at that time, youth soccer had 3 levels - Classic, Challenge, and Recreational (Rec.). The Express was a rec. league team. But let me tell you what, there was nothing recreational about it. We were out to win games. So I joined The Express. Yes, joined. There weren’t tryouts or anything of the sort. I can’t speak for every rec team out there, but the team that I played for, and the teams that we played against, were coached by dads as a hobby or side job. The Express was coached by the dad of one of my friends, who also happened to live in our neighborhood. A few of my teammates lived in my neighborhood as well. That leads me back to where I started and to my next point - the teams were coached by dads and were made up of players that were typically in the same friend group, neighborhood, country club, you get the point. Like I said above, there weren't tryouts, but the Coach still had to ask you to play. So in a way, you still had to be able to play, or at least be able to stand on your two feet. The Express was no joke. We would practice one, maybe two times a week. And our practices, from what I can remember, were ideal. We would of course have soccer specific drills that would focus on improving our game both as a team and individually, but the practices were more for exercise, or simply put, having fun. I mean at the end of the day, we were all still kids. I don’t remember how long our season was, but if I had to make an educated guess, I would say we played 6 to 10 regular season games with a tournament at the end of the year. The tournament I remember clearly, and that’s because we lost it 2 years in a row in the finals… to a team that was made up of classmates of mine, just to make things worst. The games were intense, though, and at that level, everyone plays every position. Sure, there were a few kids that specifically wanted to play keeper, but usually every kid got a run at every position at some point during the season. I can’t remember exactly what position I played, but I typically played on the offensive side of the ball. By no means did I think I was a natural center back, or even a defender at all for that matter. Humbly put, I scored goals. There were games where we would win 10-0, 14-2, and I would walk away with a hat trick - or three. It was more competitive than before, but I knew there had to be more out there. I loved playing for The Express. I was able to play with some of my closest friends growing up - memories that still come up in conversation when we’re together, and memories I still hold close to my heart. Although, just like my days at the Salvation Army and playing for my Dad, I wanted more. I wanted more structure, I wanted stronger competition, I wanted to be the best. I knew that to be the best, I needed to play against the best - Classic was the best.